This hand-hewn log house offers a unique vacation experience, add a cozy fire in the wood burning stove, a little snowfall and you have the perfect all season retreat. The house is the ideal setting for total relaxation. Get ready to unwind. At Lonesome Duck we have 200 acres and 2.5 miles of private riverfront where river, pond, meadow and mountain are yours to share with duck, geese, deer, mink, beaver, hawk and eagle. Crater Lake National Park is 30 minutes away. Lava Beds National Monument and seven wildlife refuges are all nearby. The Klamath Basin was voted #1 best birding in the West by Sunset Magazine. And our manager is a Certified Wildlife Biologist who can lead birding and nature tours throughout the entire year. A hand-hewn log house offers a unique vacation experience....add a cozy fire in the wood burning stove, a little snowfall...and you have the perfect winter retreat. The house is the ideal setting for total relaxation....get ready to unwind. Winter brings the opportunity to snowshoe (complimentary snowshoes for guests) and cross country ski at Crater Lake and surrounding areas. Snowmobile on hundreds of miles of local trails. Drive the Volcanic Scenic Byway... it's a great way to spend a day touring this magnificent part of the country. Birding is a year round activity. Fall: August & September are peak months for viewing Pelicans, Egrets, Herons, and Grebes. An estimated 2 million ducks & geese migrate through the Basin each Oct & Nov.
Winter: From Nov through Feb. over 500 Bald Eagles-the largest concentration in the lower 48 states- winter in the Klamath Basin. Spring: March to May brings shorebirds and waterfowl migrating north to Alaska & Canada. Thousands return to nest in the Klamath marshes. Summer: Brood-rearing by 200,000 ducks, geese, herons, egrets, and grebes can be seen from May to Aug.
Debbie & Steve Hilbert, attended U of Oregon---Steve played football for the Ducks and Debbie was a cheerleader. They married after college, and moved to Lake Tahoe where they started, built, and ran a successful interior design business in Incline Village, Nevada for over 30 years. Lonesome Duck has been a 20 year project that started in 1995 and turned a truly dilapidated ranch into a highly acclaimed guest lodging facility. Visitors from around the world sing high praise for the houses, the setting and the scenery......but best of all they become friends. Lonesome Duck Ranch has a 23 year track record of providing our guests with the unique travel experience they have been looking for, the family memory that will be discussed on holidays for years to come. Our friends are always anxious to return and we are blessed with the honor of their return. toilet, shower, Large bath serving master and loft with separate doors. Large master bath with full shower and separate entry for loft. World famous Williamson river--some of the largest wild trout in North America . Fly Fish only Catch & release. The ranch is bordered on the east by National Forest. Keep a close eye on the hillside and you may see deer, coyote and eagles. The sunsets can be spectacular as it flows down the mountainside. The hand hewn log guest house is on the banks of the famous Williamson River which produces some of the largest wild trout in the country. No AC needed as log houses insulate. Open kitchen with seating for up to 6. Also dining available on the porch or at the huge unique outdoor tables with lighted umbrella's. Table & chairs for relaxation. Parking for RV/Boat/Trailer, We also have, Clara (cutest & most rambunctious black lab in world) available for dog lovers fix, Woodrow Call & Sundance (paint & Arabian horses) also available for petting, Rosco Brown-July Johnson (llamas) available for walks around the ranch. There is also a 1/2 acre pond that the kids will love to swim in or try their luck with the fat bass. This property exceeded our expectations in all ways. My husband and I and our 2 boys (8 and 11 yrs) stayed here for 4 days and it was truly amazing. The boys fished nearly the entire time from the river right out back, we spent hours kayaking and canoeing, swimming in the pond, and just exploring the property. The drive to Crater Lake was also better than expected so we were able to make that drive a few times. It was excellent decision to stay here. This was very first wonderful stay and trip i enjoyed so far staying in this property. This property is very good decision to stay if somebody planning to visit to Crater lake. The house has everything to stay/cook/read/explore nature around/ river 50 steps to house. Thanks to property care taker , they are very nice people to make you conformable about the house and surroundings. This cabin is beautiful, clean and in a beautiful setting. The owners and the manager were so nice and very responsive to any questions. They allowed us to walk and explore the whole property which was awesome for our family. Our daughters loved petting the horses that came right up to the fence to greet us. The porch was great to hangout on and we had fun playing horseshoes. We didn’t realize that the cabin was connected by the carport to the managers cabin but we still had plenty of privacy. There are no windows facing their cabin so you would never know they are there. I would highly recommend this property! We really enjoyed our stay in the Lonesome Duck cabin. The owners and managers lived nearby and were very friendly and responsive. 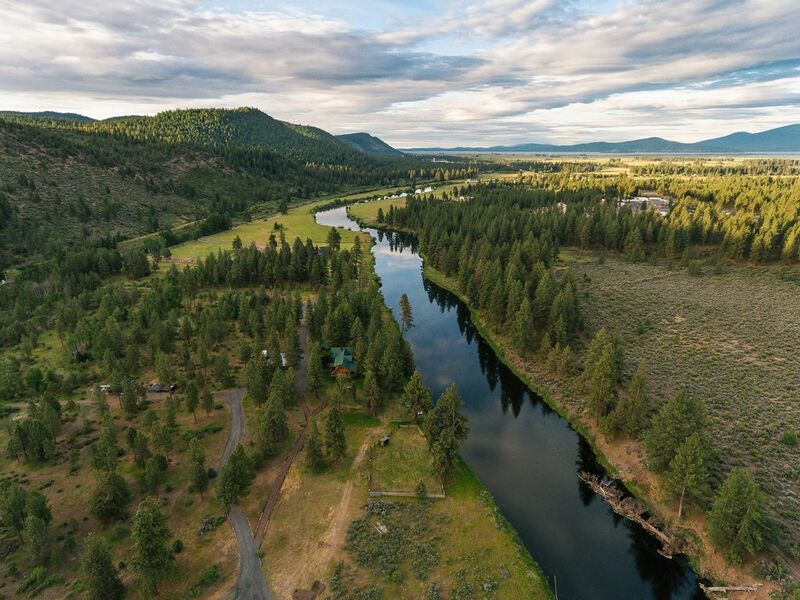 The cabin lies along a great trout fishing river and includes, canoes, kayaks, etc. We had great fun kayaking up the river and seeing bald eagles and turtles. The ranch is very well maintained and had several trails throughout. There is a little bit of noise from the nearby highway and train tracks but it was hardly noticeable. We loved the hammock and the horseshoes too. I know this lovely cabin is a fisherman's paradise in summer, but don't discount its charms in the winter months! The bird watching is outstanding, the river flows by at your very doorstep, the wood-burning stove creates a warm and cozy retreat from all your cares, and Crater Lake (which should not be missed in all the majesty of its snowy surroundings) is a relatively short drive away; borrow a pair of the complementary snowshoes and head up there for a hike. The bedrooms are incredibly charming and homey, with comfortable beds. The hosts and owners will greet you warmly and happily provide you with whatever you need to make your stay perfect. I have visited Lonesome Duck for four years in a row now. It is one of my winter priorities, and I love every second. Looking forward to many years to come! We had 7 adults (2 couples, 3 individuals) and we were so comfy and cozy in this wonderful home. The owners were fabulous -- friendly and helpful. We 100% recommend you stay here. Golf: Get in a round of golf on the Arnold Palmer course at the Running Y (voted one of the best 100 public courses). call for special group rates * Rate based on double occupancy ...additional charges for more than two guests. Check for special deals.